As usual we get some bug fixes, smaller memory footprint and other small improvements. Most important changes for this version of Firefox seem to be better WebGL support, integrated Twitter search and improved security for third party add-ons. There is really nothing to say about integrated Twitter search except that you get blue bird among your search engines. In earlier versions of Firefox this functionality was possible only by using extensions, I’m not sure how many people need this but if it was made as some sort of a deal between Mozilla and Twitter and Mozilla gets some money out of it than I welcome the change. 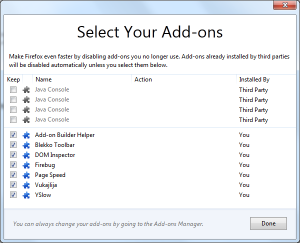 First thing you will notice upon installing Firefox 8 is dialog window with all your extensions listed. 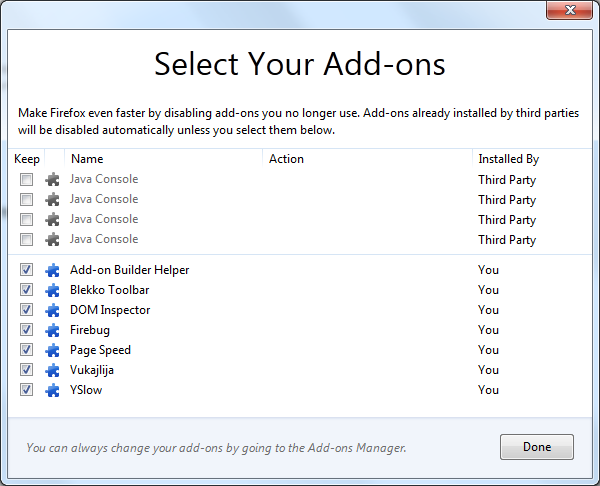 Most importantly, all third party add-ons which you didn’t install by yourself will be disabled by default. This goes for future add-ons as well. You do get the option to turn them back on, although I don’t think you will miss any of those nonsense add-ons that install themselves without asking the user if he actually want’s them installed. This is very good security feature, because I can’t tell you how many times I find rouge extensions installed on my friends computers.